Image via WikipediaSaw the news yesterday about our newest American Consulate General which was opened in the southern Iraqi city of Basrah, on July 5. Erbil, July 5 (AKnews) – The US Ambassador to Iraq Jeffry Filtman officially opened the US consulate in the oil-rich southern port city of Basra today. Biber Kamble was officially assigned the US consul general in Basra. The consulate will also be responsible for the provinces of Mithan, Thiqar and al-Muthanna. On July 5, U.S. Ambassador James F. Jeffrey officially opened the U.S. Consulate General in Basrah, Iraq, with Assistant Secretary of State for Near Eastern Affairs Jeffrey D. Feltman in attendance. The U.S. has had a diplomatic presence in Basrah dating as far back as 1869. The U.S. Consulate in Basrah closed in 1967, although civilian U.S. agencies working with military colleagues in the Provincial Reconstruction Team (PRT) have made memorable and lasting contributions to Basrah Province, including projects to provide water treatment, schools and other educational facilities, and a hospital. During the opening ceremony, Ambassador Jeffrey invoked the commitment shared by Iraqis and Americans to freedom and democracy, as well as the authority granted to him by the President of the United States and the Secretary of State, elevating the U.S. PRT to the status of Consulate General. He also announced the pending appointment of Ms. Piper A. W. Campbell to the position of Consul General. The consular district for U.S. Consulate General Basrah will include Basrah, Muthanna, Maysan, and Dhi Qar. Active links added above. As to the name of the new Consul General in Basrah, note that “Biber” is Turkish for pepper. 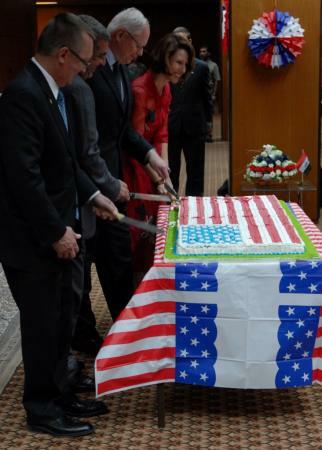 Consul General Piper A. W. Campbell cuts the cake during the official opening of the U.S. Consulate General July 5 at the Basrah International Airport in Basrah, Iraq. Southern Iraq’s Basrah province is the economic engine of the country. With a population that exceeds 1.6 million, the country’s second largest municipality is the city of Basrah. All of Iraq’s maritime ports are located in Basrah province, which is the source for half of Iraq’s gross domestic product. Bordering Kuwait, Basrah province also generates 75 percent of the government of Iraq’s revenue, and 85 percent of Iraq’s oil exports pass through Basrah. PRT Basrah is headed by a senior State Department Foreign Service Officer who leads a team of experts in petroleum and gas, port development, essential services, rule of law, governance, agriculture, and public diplomacy, as well as representatives from USAID and the U.S. military, and a growing staff of local nationals. Oil contracts from the Government of Iraq have attracted numerous international oil and oil-service companies to Basrah Province, where seven percent of the world’s proven oil reserves are located. The Basrah PRT has positioned itself to support the increased economic activity that oil business will bring to the province. Well, with US Consulate General Basrah now officially open, no one can accuse the United States of doing that. The trip started in Ottawa with stops in Iqaluit, Pond Inlet, Resolute Bay, Eureka, Kugluktuk, Inuvik, Dawson City, Whitehorse, Fort Simpson, Yellowknife, Churchill, Moosonee then back to Ottawa. The first thing I have to say about Resolute is that it has my favorite name of any city in the world. What could be better than to say you were from Resolute? And since the population is 250, not many people can say that. The second thing I’ll say is that the place has a special meaning to many Americans. It is named after a British naval exploring ship, the HMS Resolute, which explored Resolute Bay in search of the Northwest Passage in the mid-19th century. In the winter of 1852, Resolute became beset in the ice and the crew was stranded for three years before being rescued. Several years later American whalers saw the HMS Resolute floating in the open waters. They sailed it to safety whereupon the United States refurbished her and gave her back to England. When the ship was finally decommissioned, Queen Victoria had a desk made of the ship’s timbers and gave it as a gift to the United States in appreciation for the ship’s rescue. Today the so-called “Resolute Desk” sits in the Oval Office and is used by the President of the United States. Some people have seen the Resolute Desk. Not too many have seen Resolute. I’m one of the very few who have seen both.